Boxes capable of streaming media from a PC to your TV have become commonplace in recent years. Even games consoles have got in on the act. Few, however, have added Freeview recording into the bargain. The WyPlayer from French manufacturer, Wyplay, offers both. On the one hand it's a media server capable of streaming media (wirelessly or via Ethernet) from a PC or network hard drive, as well as content from the web for viewing on your TV. On the other, it's a twin tuner Freeview PVR. It's sold drive-free, but you can easily add your own SATA drive or a choice of fitted hard-disk drives ranging up to 1.5TB in size. 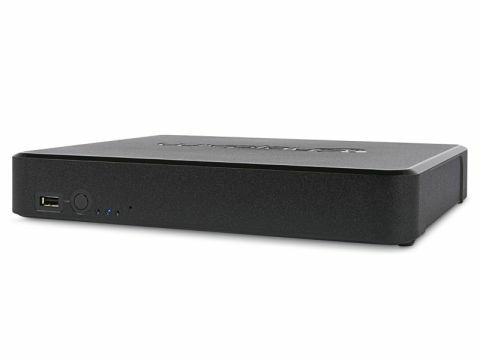 While its minimal design is similar to the Apple TV box, the Wyplayer is a good deal larger and heavier and runs fairly noiselessly. There's no display on the front other than a row of small LED indicators that show when the Wyplayer is recording. This is accompanied by a single USB port for file transfer and playback. On the rear sit two more USB inputs, plus an output for taking media off the hard drive. The classy-looking remote control makes effective use of a 'coin key' control operation, whereupon a thumb-controlled wheel is used to scroll around the menus and perform other functions such as fast forwarding and rewinding. You select options by pressing down in the middle and skip backwards and forwards between menu screens by pressing the edges. The machine is billed as offering HD TV reception, but this only applies to France, and some of its European contemporaries such as the DVB-T2 chips required for Freeview HD reception in the UK are not yet in circulation. However, the Wyplayer can upscale Freeview channels to 1080i via the HDMI socket. Digital channels can be browsed via a full Channel list that enables you to view up to five hours of listings for the current channel with synopses displayed on the right. Alternatively, there's an EPG displaying seven days' worth of listings for three channels at a time displayed vertically. There are two tuners on board though you're limited to watching or timeshifting one channel while recording another. Recordings can be instigated by pressing record, via the EPG or using a manual timer with once, daily or weekly repeat options. Don't expect such niceties as automatic recording, however. You cannot watch a recording from the start while one is still in progress, either, but you can record while in Standby. Most welcome is the ability to transfer recordings (made in the MPEG-2 transport stream format) to an external USB-connected drive. Web streaming functions come in the form of YouTube browsing (HD included) supported by a search option, and a separate portal which enables you to access podcasts, RSS feeds, video and other websites. Settings for this (including creating favourites lists) can be altered remotely via the Wyplayer website. The coin-pad control method works pretty well, although fast forwarding and rewinding is not as precise as we'd like. Some of the few accompanying buttons are also obscurely labelled and that can cause confusion. More onscreen prompting would have been welcome. The menu system is one of the best presented we've seen on a device of this type, again with a hint of Apple about it. Nevertheless, scrolling around the EPG can be a rather sluggish experience at times. Each function is neatly grouped into universes – 'TV', 'Photo/Video', 'Music' and 'Web Services' and any files available from remote sources (including folders) are added to the relevant lists. You can create playlists for music files and play music while viewing photos. Happily, connecting to your home network can be handled automatically so there's no tedious configuring of IP addresses. The Wyplayer is compatible with uPnP/DNLA devices and we were able to easily browse content stored on our PC using both Windows Media Connect and Twonkey. The Wyplayer supports an impressive range of media formats including MKV and ISO (DVD image) and .MOV video files, as well as the expected DiVX and Xvid. We had no trouble playing the myriad files in our laptop's library. Streaming HD files is predictably quicker via Ethernet than wi-fi , though the latter gave reasonably stable results when using a wireless router located in the same room. Video looks best piped through the HDMI port with quality faithful to that of the original source. Don't expect HD results, but pictures from the Freeview tuner do look a touch smoother upscaled. They're pretty acceptable in their original form, too. In marrying a media server to a Freeview PVR, the Wyplayer offers better value than many rival products on the market. Both elements are well integrated, although the lack of dual recording and Freeview+ features such as series linking is disappointing, but understandable considering the product is built for the broader European market. A little more refinement on the controls would also have been welcome, but otherwise this is among the best of a recent glut of media servers to appear.